The dot for dot command is useful for icons/web graphics/etc. but not for to-be-printed media, as it displays each pixel at 100%, as one pixel on the screen, vs. showing the real size. The zoom command comes with an entire submenu of its own, allowing you to zoom in/out, fit the image in the window, fill the window, or choose from several zoom ratios available. The shrink wrap command resizes the window so that the image fits in the screen without excess canvas shown, as best it can with the proper circumstances. The full screen command allows you to toggle whether or not Gimp takes up the entire screen. The navigation window command opens the navigation dialog, to allow you to more easily move the image on the canvas, and/or move around in the image. The display filters command show the filter dialog box. The show selection command toggles whether or not the selection boundary line is solid or dotted/animated. The show layer boundary command toggles whether or not the dotted line around the boundary of your image is enabled or disabled. The show guides command enables and disables the guide overlay feature. Guides can be created by clicking on a ruler and dragging a line (guide) onto your image, wherever it is needed. You can select and drag guides to move them at any time, or drag them back into the ruler to remove individual guides from view. 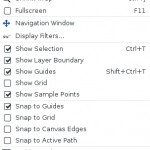 The show grid command enables and disables the grid overlay feature. The show sample points command (toggle), when enabled, allows 4 unique sample points to be seen on the screen, if the points are selected. Sample points are picked by holding down the Ctrl key, clicking on the ruler, and dragging the crosshairs to a point on the image. Details about the selected sample points (colors) are shown in the sample points dialog. The snap to guide command, when enabled, helps you place image elements by pulling toward guide points when a selection or layer is moved. The snap to grid command, when enabled, helps you place image elements by pulling toward grid points when a selection or layer is moved. The snap to canvas command, when enabled, helps you place image elements by pulling toward the canvas edge when a selection or layer is moved near it. The snap to active path command, when enabled, helps you place image elements by pulling on the next anchor point of the active path when a selection or layer is moved. The padding color command changes the padding color — the canvas color below/surrounding images — to light/dark/darker or even a custom color. The show menubar command allows you to toggle whether or not the menubar is enabled/shown. If you *ahem* accidently loose the menubar by clicking on the toggle option to disable it (don’t ask me how I know!) you can right-click on an open image and toogle it back via the menu options that are displayed. The show rulers command allows you to toggle whether or not the rulers are enabled/shown. The show scrollbars command allows you to toggle whether or not the scrollbars are enabled/shown. The show statusbar command allows you to toggle whether or not the statusbar is enabled/shown.